Ellison not only finds one body, not two, but three, and Detective Peters is none too happy with her. For that matter neither is Detective Anarchy Jones, her father, or her mother who obviously thinks Ellison must plan to find these bodies or be the one to call the police at least. Only, while she deals with the family scandal of her father's other daughter, Karma, Ellison discovers lots of things have been going on in the brokerage house - possibly the motive for all the murders. 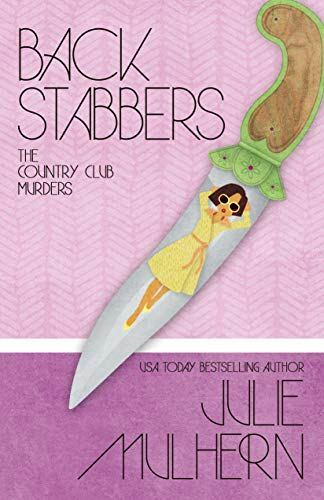 As with the others in this series, Back Stabbers is well-written, well-paced, and includes an occasional touch of humor. 'Mother' rises to the occasion but only after chastising Ellison as usual. My favorite character, after Ellison of course, is Anarchy Jones. The family dynamic and the tension in relationships adds to the mystery. Although part of a series, this can be read as a stand alone. If you like smart, stubborn, and sassy women sleuths, though, you'd be better off starting at the beginning of the series. Christa, thanks for hosting me and #thatotherthing! My pleasure - I enjoy this series! Sounds like a series I should be reading. I'd recommend it and start at the beginning! Thanks for stopping by.